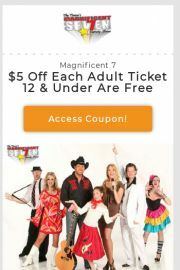 If you’re looking for the best Branson Magnificent Seven coupons, you’re in the right place! 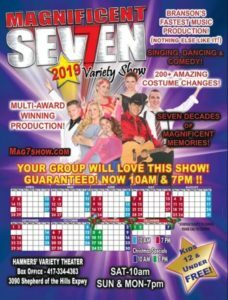 The Magnificent Seven Variety Show takes you on a musical journey from the 1940’s through today! You will hear everything from Rock and Roll to Broadway as they take you through the decades of your favorite music and hottest of hits! The husband and wife team of Joe and Tamra Tinoco have built a loyal fan base that return every year to see them perform new acts they produce. They have put together a beautiful and moving gospel segment and one of the most inspirational patriotic tributes to our Veterans and country! Joe and Tamra are now also joined by their talented daughter Talya who will share amazing performances along with her parents and the very talented cast of other singers and dancers on the stage. This wonderful cast of singer and dancers will light up the stage with a beautiful display of color and elegance with costumes for every era… 200 costume changes take place during the show, making Magnificent Seven have one of the biggest wardrobes for a live show in the country! Now thats alot of clothes! Don’t miss this cast of performers feature a show full of singing, dancing and music that the family will love!